½ c. frozen berry medley, thawed (strawberries, blackberries, blueberries, and raspberries) Strain them to remove excess juice. Preheat oven to 400º and line baking sheets with parchment paper. Add the fruits to a food processor. Pulse for a few seconds until they are crushed up. Then add cream cheese and sugar. Mix for a few more seconds until just barely combined. Do not overblend. Unroll the pie crusts onto a lightly floured surface. Use a rolling pin to make sure they’re smoothly rolled out. 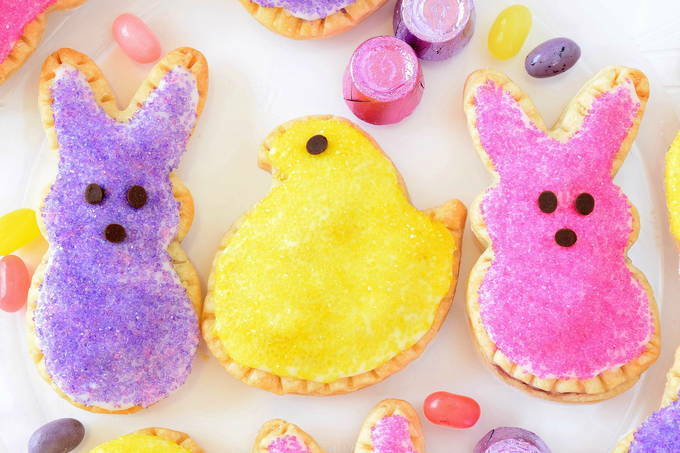 Use the Peeps™-shaped cookie cutters to cut the dough into shapes. Continue to work the remaining dough by first brushing off any flour on the back. Roll the remaining dough out to 1/8” and cut again to get 32 shapes total. Make sure you have an even number of each kind (for top and bottom pieces). Put 1 to 1¼ teaspoons of the filling in the center of 16 shapes. Working one at a time, wet a pastry brush with water and lightly brush all of the edges of the bottom of the shape that’s going to be on the top of the tart. Put it on top of the filling. Gently press down on all of the edges with your fingers. Then use a fork to carefully but firmly press down on all of the edges. This seals it. IMPORTANT: Use a toothpick to poke 3 holes in the center of each tart through the top dough. Place them on the baking sheets. Bake for 12-13 minutes. Let cool. Icing: Stir together the milk, powdered sugar, and vanilla until smooth. Working one tart at a time, spread icing on the cooled tarts almost to the edge. Sprinkle colored sugar on thickly over a paper plate. Press in the tip of mini chocolate chips for eyes and a nose on the bunny. Makes 16 tarts.